Designed to save you time and money – what is there to lose? Hello and welcome to spark! 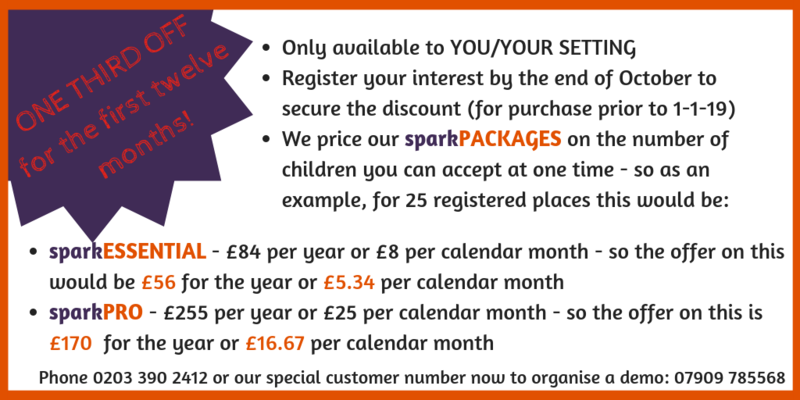 If you would like to take advantage of the very special offer below, exclusive to new clients referred to us from www.essexearlyyearsjobs.com, then please send us a message HERE, or phone the number below, quoting ‘EEYJ2018’. Someone from the spark team will be in touch soon. In the meantime, please take a look at our sparkPRODUCTS and get a feel for which package might be right for you.